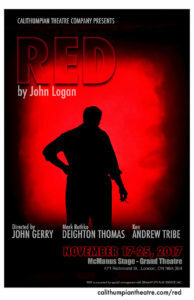 A few years ago I talked to John Gerry about a play I was planning to produce, and he asked me two pertinent questions: “Why this play, and why now?” In his director’s note for Red , he answers the former with a personal story of a trip to New York City with his artist father, who introduced the then-seven-year-old to Mark Rothko. Which leaves the question of “Why now?” From a purely pragmatic point of view, it’s obvious: John Logan’s play was only written in 2009, and Calithumpian Theatre has only been around for about a year. (It’s interesting to note that Gerry’s previous company, Fountainhead Theatreworks, produced Yasmina Reza’s Art , which focused on a single colour field painting, just after Red opened—and closed—on Broadway.) It’s also enough time to distinguish this Red from 2013’s Cornelia Hoogland play, which Gerry also directed. But, in a larger sense, why this play now? Perhaps it’s due to Rothko himself, who’s portrayed as a large-framed, bombastic egotist who has no interest in the opinions or experiences of others—least of all from his (fictional) assistant—unless they somehow relate to him. “I’m fascinated by me,” he boasts in 1959, perhaps referring to a certain “non-“politician whose rise to executive power began about 50 years after the play’s setting and peaked almost exactly a year ago. Or maybe not. I review, you decide. The play itself is not overtly political. Much like Reza’s piece, it’s a meditation on—or perhaps an argument about—the nature of art and how it’s received and interpreted. Rothko believed that his work would—indeed, deserved to—stand with Rembrandt, Caravaggio, and Van Gogh. Was he right? I have no idea. ( The Guardian ‘s William Boyd does, though.) Audiences will be able to judge for themselves, as reproductions of Rothko’s paintings are used as props and set design; they may very well be reproductions of specific paintings, which would be a statement in itself. The discussion of art, its meaning and purpose, and what colours really mean will be interesting to some, and ponderous to others. Assistant Ken’s story about why he associates white with death is the most easily accessible part of the play, which is ironic because it’s a whole-cloth creation of playwright John Logan in the middle of a play that’s based on fact. I personally found the technical aspects of dealing with a canvas the most compelling part of the stagework. That’s no slight to Deighton Thomas (Rothko) or Andrew Tribe (Ken), who perform their roles well; there just isn’t much meat in the script, which leaves them with little to develop emotionally. The Mark Rothko that enters at the beginning of the play is the Mark Rothko that exits at the end, and Ken is the employee who he hires and fires. There’s a fascinating film on at the Hyland Cinema this week called Loving Vincent that raises interesting questions about Van Gogh’s life and death. Every one of its 853 shots—65000 frames—is a unique oil painting, created by a team of over 100 artists. I’d encourage audiences to see both; you’ll come away with a deeper understanding and appreciation of their subjects, and isn’t that the real reason that these pieces exist?